Should big brother stay in a crib? Or move into a bed? He will be two years old next month. Please see above for new one. I vote to move him to his own little bed. There will be adjustment with the new little brother so if you do it before he won’t feel “his” bed is being taken by the “other” child. They seem to get so excited when they get to sleep in a big bed. I tried to vote, but my internet connection is being weird this morning. I say, go for it! It is great that you have him sleeping on a pillow already. That will help with the transition. It will also be easier to help him with the change before you have a newborn to take care of as well. He’s probably ready to move to a big boy bed. I put my kids in a twin bed when they were about 18 months old. I purchased those slide under the mattress side rails and pushed the other side into the corner of the room. This prevented them from falling out of their bed. I don’t think you should have to worry about bubbers getting out of his bed and running around at night while you need your sleep. 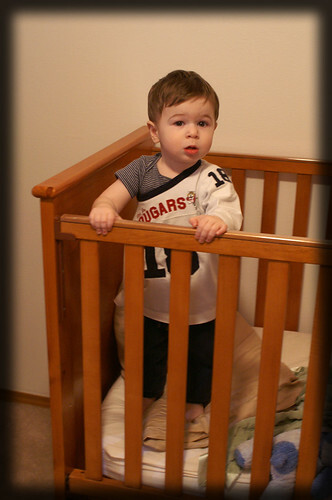 I don’t move my kids to a big boy bed until they are climbing out of their crib. Unless you’ll be using bubbers’ crib for the new baby, then you should do it asap, we don’t need any turf wars with your new little one. I vote for moving Bubbers to a big boy bed. Dylan was about 2 when he transitioned. He did a good job staying in his bed (no running around at night). I agree with everyone else, that if you are planning on using the crib for the new baby, then move Bubbers before the baby arrives. I can’t vote for either, not knowing Bubbers! I mean, some kids are definitely ready for beds by 2 (my kids all made the transition at about 18 months but that’s because they were climbing out of their cribs). But other kids seem to relish the security of their cribs up through 3 and longer. You’ll just have to make the call!